Don’t know about your neck of the woods, but it is bitterly cold here. So cold, in fact, I am reminded of a fabulous driving trip I took with Mr. Tofu to Northeastern Eatly, er, I mean Italy. It wasn’t snowy and cold yet when we were there in September, but the farther north we got, the more the villages and landscape looked like scenes from the Sound of Music and the cozier and more German-inflected the language and food got. In pine timber lined dining rooms in front of flagstone fireplaces incongruously situated in the center of the rooms, we ate cozy dishes that married the finesse of Italian cooking with the heartiness of Austrian and German cuisine. Dishes like this rib-sticking gnocchi. The word gnocchi has German roots and roughly translated means “knot of wood, ” probably because of their little round shapes. Though the word has Germanic roots, Italians all over Italy pair the potato-based dumplings with traditional pasta sauces like tomato, basil pesto and the like. But further north, you’re just as likely to find the tender little pillows of dough tossed with nutty cow’s milk cheese, speck (smoked bacon), caramelized onions, cream, butter, and even tender cabbage. While I love to use Niman Ranch’s stellar smoky applewood bacon in this quick weeknight dish, my vegetarian husband Mr. Tofu does not appreciate the pork. So after I point out to him what he is missing (and he ignores me), I toss half of the gnocchi with the rich sauce sans bacon. Then the remaining gnocchi and onion-cabbage sauce gets the bacon treatment for me. On a good day, I make my own gnocchi, I really do. (Email me if you’d like the recipe.) But on busy days, I buy frozen gnocchi from Sheridan Fruit Market in Portland, Oregon. They taste of potato and have a nice light texture, plus you can boil them from the frozen state, so dinner can be ready in about 8 minutes, if you play your cards right. If you’re not lucky enough to live here, try Trader Joe’s gnocchi. They aren’t half bad; not too gummy with a rich flavor akin to the real deal Italian gnocchi. Heat the oil in a large skillet over medium high heat. When the oil shimmers, add the onions and saute, stirring frequently, until they begin to brown, 5 minutes. Reduce heat to medium and continue to cook until the onions are light brown, 3 minutes more. Add the garlic, cabbage,caraway, and 3 grinds of pepper. Cook, stirring frequently, until the cabbage is wilted, tender and beginning to brown, 7 minutes. Add the broth, bring to a simmer, reduce heat and cook until liquid has reduced by half. While the sauce is cooking bring a large pot of salted water to a boil and preheat broiler. Microwave the bacon until crisp, reserving some of the fat; set aside. Add the gnocchi to the boiling water and cook until they float to the surface and are tender when bitten into, about 7 minutes for frozen gnocchi. Drain the gnocchi. Vegetarian: Toss half of them with half of the cabbage mixture and transfer to a gratin dish. Top with half of the cheese. 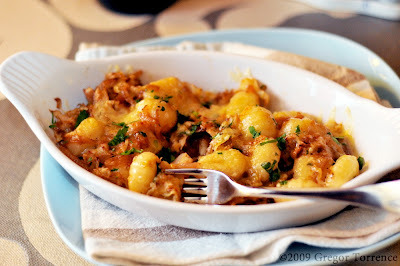 Toss the remaining gnocchi, sauce, and bacon with 1 tablespoon of rendered fat together in another gratin dish. Top with remaining cheese. Place both gratin dishes under the broiler and broil until cheese melts, 3 minutes. Okay definitely on my menu. I’d kill for the homemade gnocchi recipe too. Put the unpeeled potatoes in a large pot. Fill the pot with enough cold water to cover the potatoes by at least 2 inches and bring to a simmer over medium-high heat. Reduce the heat to medium, partially cover the pot, and simmer the potatoes until they are completely tender and easily pierced with a skewer, 30 to 35 minutes. Drain the potatoes, let them cool just enough that you can handle them, and then peel them. Cut them in half crosswise and pass them through a potato ricer or sieve into a large bowl. Let cool until almost at room temperature, at least 20 minutes. Lightly flour a work surface. In a small bowl, mix the flour with the salt. Add the egg to the potatoes and then add the flour mixture. Mix with your hands until the flour is moistened and the dough starts to clump together; the dough will still be a bit crumbly at this point. Gather the dough together and press it against the bottom of the bowl until you have a uniform mass. Transfer it to the floured surface and wash your hands. Knead gently until the flour is fully incorporated and the dough is soft, smooth, and a little sticky, 30 seconds to 1 minute. (Don’t overmix it, or the gnocchi will be tough; the dough should feel very delicate.) Move the dough to one side, making sure the surface underneath it is well floured. Cover it with a clean kitchen towel. Remove any lingering bits of dough from your work surface and lightly reflour the surface. Tear off a piece of dough about the size of a large lemon and put the towel back on the rest of the dough so it doesn’t dry out. Classic Italian homemade gnocchi are pressed on a fork to curl them and impart the traditional ridges. To save time, I just cut them in small squares and leave them as cute little pillows. I think they look prettier, and they’re a lot less fussy to make. With a sharp knife or a bench knife, cut the rope crosswise every 3/4 inch to make roughly 3/4-inch-square gnocchi. Arrange the gnocchi in a single layer on the parchment-covered baking sheets, making sure they don’t touch. Repeat until you run out of dough, reflouring the work surface as needed. When all the gnocchi have been cut and spread out on the baking sheets, sprinkle them with a little more flour. Give it a try, really it’s a 20 minute meal, though it looks like your Austrian-Italian granny took ages to make it. Yummy! This looks so good Ivy! I have got to make this soon. What gnocchi do you suggest I use? I made it once, so much work. Thanks again for the great recipe. i just made gnocchi for this first time this week and hope to post about it soon! this meal looks wonderful! Very yummy blog and congrats on the foodie blogroll! Thanks, Pam and Simply Life! I made this for dinner last night… it was very well received by my husband! Thank-you for posting this! You are most welcome! Glad you liked the gnocchi, thanks for stopping by! My friend cooked lasagna for St. Patrick’s day. I suggested this recipe as an appropriate substitute.